The Leader in Laser Marking Software. 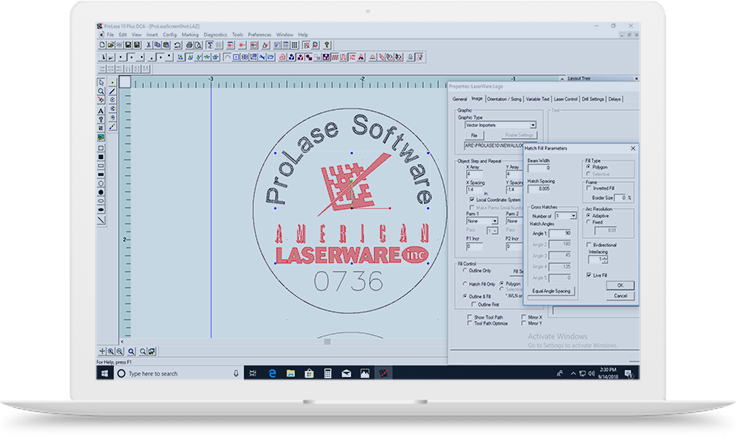 The world’s largest independent supplier of galvanometric laser marking software, American Laserware, Inc. offers a variety of laser marking software solutions for both end-users and OEMs. Incorporating decades of experience, our products are the brains for more than 4,500 industrial laser marking systems located all over the world. We support most available galvanometric servo interfaces including analog and digital. Our products are designed to work as retro-fit or original components on most galvanometric laser marking systems. Our most current product is ProLase for Windows 10. This high-end laser marking software system is richly featured, loaded with advanced capabilities, including importation of many vector and bitmap graphics formats, finely tunable bar code formats including ID Matrix 2-D codes, precise vector hatch fill for graphics , True Type fonts, ID Matrix 2D bar codes, tool path optimization, and a large variety of configurable drivers for various laser/galvanometer configurations to name just a few. ProLase 10 runs in all Window’s operating systems from Window’s XP to Window’s 10. App Arrays allows for quicker determination of proper laser parameters for new materials. Among its many features are ease-of-use, high performance, and flexibility that give you the best laser marking software on the market today. Designed to be both a retro-fit package and the original software on new machines, ProLase can support a large variety of galvanometric hardware configurations, including most existing laser marking systems, marking heads and lasers. Whether it is for the integrator looking for a richly featured platform flexible enough to support all their marking solutions, or the job shop that demands that highest quality engraving possible, ProLase is the right choice. Text, barcodes, graphics, fonts, fills, automation, parts handling, machine control, interfaces, transformations, security controls, support, quality, flexibility, affordability and more! List of downloads include current versions of ProLase 10, and Archive of older versions. Copyright 2018 © American Laserware | All Rights Reserved.